You couldn’t be blamed for thinking that you were somewhere else when faced with the veritable embarrassment of riches on L.A.’s major stages this month. With a great version of Lynn Nottage’s Ruined playing at the Geffen Playhouse in Westwood, the Center Theater Group has scored a major success by importing the superb Long Wharf Theater revival of Williams’ The Glass Menagerie nearly perfectly intact to the Mark Taper Forum. This will undoubtedly be one of the best shows of the year here in L.A. and I can’t recommend it highly enough. The most publicized reason for the show's success to date has been the master class performance of Judith Ivey as Amanda Wingfield. She deserves every accolade she can get for this performance. It is tough, nuanced and swims in complexity for a part notorious for its pitfalls. Yes, Amanda is suffocating, interfering and pathologically charming. The surprise is that she is frequently funny, warm and just as often painfully right in her assessments of her fractured family. Ivey’s Amanda Wingfield is brilliant not simply because she can be both sympathetic and repulsive at the same time. It is a great performance because of Ivey’s ability to point out exactly what her character understands – that her children are in serious trouble and this family’s sinking ship needs some desperate bailing whether or not she's going about it the right way. But let me talk about what else is so right about this production. Patch Darragh’s Tom is beleaguered but not much nicer than his mother. He is able to bring out the autobiographical overtones of Willimas’ play without overwhelming it. Meanwhile, the restrained physicality of Keira Keeley’s Laura almost steals the entire second act. The only newcomer to the production fromn its East Coast run is Ben McKenzie who is excellent as the Wingfields’ gentleman caller Jim. But equally good to these stellar performances is the beautiful and very smart set design by Michael Yeargen under the direction of Gordon Edelstein. The dark, brown shabby set doubles as both hotel room and family apartment reinforcing the memory aspects of the play, often blurring the line between the temporal narrative and Tom’s later recollection of them as if they might be stream of consciousness. Lighting designer Jennifer Tipton deserves special mention here for a performance that is equally as remarkable as Ivey or anyone else on stage. Tipton is working overtime in L.A. this fall where she is lighting not only this play, but a dance piece from Sardono Dance Theater that opens the REDCAT season on Thursday the 16th as well as L.A. Opera’s world premiere of Catan’s Il Postino starting on the 23rd. I can’t recall the last time I saw such effective and profoundly understated lighting for a stage performance. The Wingfields’ rooms are dark and hazy in an evocative memory-referenced way. It is always too dark for them, but never in a way that the action cannot clearly be seen. And with the final scene proceeding largely in candlelight there is a beautiful lyricism to the whole mise en scène. This is a masterful production that takes on the frequent and real laughs of Williams’ play honestly without ever shorting the audience on the real heartbreak of this unraveling family. Don’t miss it at The Mark Taper Forum through October 17. Nothing could ever possess me to watch "The Glass Menagerie" again in this lifetime, but your appreciative writing about this production is simply wonderful. You (almost) make me want to see it. Really, your theater writing is getting better and better. Thanks for the encouragement. 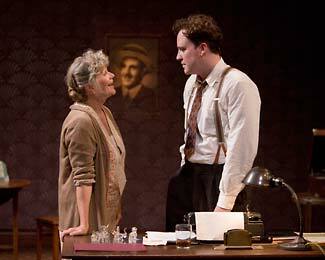 And you really should see this particular Glass Menagerie if you can. You won't regret it.